It doesn't matter if I don't have a decent photo of this jam yet (I can always edit the post later) or if I have other things I should be doing other then try to come up with adjectives that describe why you should make this jam. I need to post the jam recipe before I lose my notes on it again. This recipe has already moved up to the must have jams category, so I need to preserve it here. It really is a miracle I found my notes at all, after all they were tucked into my favorite jam cookbook , a place so sensible I I surprised I thought to look there. When I was first planning on what to do with all my sour cherries I had no plans on incorporating wine. I knew I would make one with raspberries and after that I had several other combinations I was imagining. However after spending the morning picking 10 pounds of sour cherries, I took a moment before melting in the kitchen to post about my haul and dreams of flavor combinations on Hippo Flambé's Facebook page. One reader was reminded of an ice cream topping she loved and wrote, "There is an ice cream shop on Cape Cod I used to frequent when I lived there and they cooked down sour cherries with balsamic vinegar, bordeaux, and sugar, and drizzled it over vanilla ice cream. It was my kind of heaven." I could immediately taste the sauce in my head and it sounded like my kind of heaven as well. So I quickly updated my plans to include a jam with similar ingredients. I didn't have any bordeaux in the house but I did have Michael David's Petit Petit which has the rich flavor of ripe cherries when you drink it. So I rushed to the kitchen and started a batch of sour cherry jam with a cup of petit petit wine. I had every intention of adding balsamic vinegar at the end but I tasted the jam first and could not bring myself to change anything. Just to be sure, I served the foam over a bowl of vanilla ice cream and further sampled its flavor before happily sealing the jam in jars. The jam has a richness, intensity and depth that reminds me of chocolate. It is the perfect topping for vanilla ice cream but is equally at home on a slice of toast. I imagine this winter I will drizzle it on cheesecake and layer it with poached pears and whipped cream. I also know next summer I will be back in the kitchen making more. Like my other sour cherry jams this one does not use any commercial pectin. It relies on apple and lemon pectin instead and so has less sugar to mask the flavor then would be needed with commercial pectin. I used apples from the orchard where I picked the sour cherries. In early July they are completely unripe and full of natural pectin. If you don't have access to unripe apples you can use granny smith apples or crab apples. The apple pectin combined with the pectin in the lemon peels makes this jam set up beautifully. 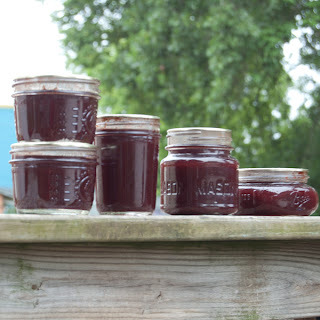 If you need detailed canning instructions they can be found on last summers sour cherry jam recipe. 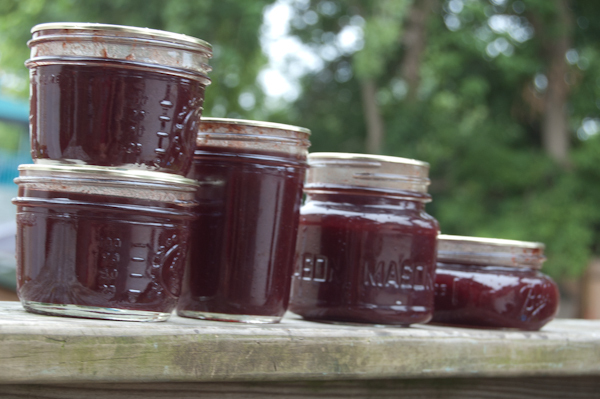 I also have a recipe for sour cherry raspberry lime jam. Place a small saucer in the freezer for testing the jams set. Combine all ingredients except the lemon rinds and the apple peels and pits. Puree the ingredients in a large pot with an immersion blender or in a blender. Add the spent lemon rinds and the peels and pits of the apples (apple pieces placed in a large tea ball) in a large pot and bring to a simmer. Simmer gently, stirring constantly until the sugar dissolves. Increase the heat to high and boil the jam, stirring frequently at first and as it cooks down stirring more and more to prevent scorching. The jam is done when it is 220° on a thermometer and it passes the cold plate test. To test the jams set with a plate, turn off the heat under the jam. Remove the saucer from the freezer and place a small dollop of jam on the plate. Return the plate to the freezer and allow it to cool for 5 minutes. If the jam is set it will wrinkle on the surface when you push the dollop with your finger. The jam will still be a liquid in the pot when it is set. Jam becomes runny again when it is heated so do not expect it to look like jam in the pot. Ladle hot jam into hot jars leaving 1/4 inch headspace and seal in a boiling water bath canner for 10 minutes.